If you love the idea of a portable tablet PC, but can’t really come to grips with the lack of a physical keyboard on such devices, Lenovo’s S10-3t is here to help. 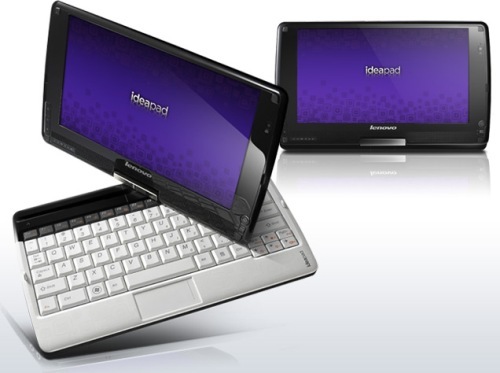 This convertible tablet netbook features a screen that swivels 180 degrees and lies flat, so you can have the conveniences of both a touchscreen and a physical keyboard. The Lenovo S10-3t isn’t a breathtaking netbook. It has a very shiny (and fingerprint-attracting) cover with a glittery square pattern. 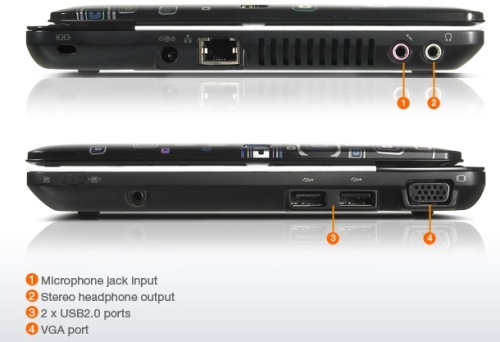 Its connections include two USB 2.0 ports, an ethernet port, a VGA-out port, headphone and microphone jacks, and a front-loading SD card slot. I definitely appreciate the full-size physical keyboard–but in tablet mode, you have no virtual keyboard, which can be very annoying if you like to work in that mode. The keys are nice and big, but a little too springy for my taste–they have no weight at all, which makes typing uncomfortable and promotes typos galore. The trackpad is another story–it’s about an inch-and-a-half tall, with two integrated buttons denoted by tiny dots on the lower corners. And it’s textured, so there’s no mistaking where it is (though, if you blink you might miss it). For what it’s worth, the trackpad works nicely. Scrolling is smooth and the buttons are easy to press. It’s just so small. Lenovo presumably didn’t spend too much time (or real estate) on the trackpad because the good old touchscreen is right in front of you, but still, I would’ve appreciated something a little larger. The 1024-by-600-pixel touchscreen is a single-input multitouch display that gives the user a pretty decent experience. It’s not the most precise touchscreen we’ve ever used, but it’s good enough to take the place of a trackpad. The IdeaPad has an accelerometer, but it was shaky at best–every time you lay the device flat, it gets confused and picks a random orientation (instead of just sticking with the orientation you had before)–annoying. You also have to wait 3 to 5 seconds as the desktop reorients itself. No stylus is included, and writing on the screen is pretty much a lost cause. You’ll have to find or buy your own stylus if you plan on using the “notes” feature. The screen is also highly glossy–not such an issue if you’re using it as a netbook, but a big problem if you’re using it as a tablet. The screen is quite reflective, and from some angles you can barely see it at all. Audio and video are pretty dismal. I couldn’t even stream a standard-definition one-minute clip of Family Guy without choppiness and lag, and downloaded video isn’t any better. Even the sample preloaded clip (of horses and ducks and other nature things) looks more like a series of still pictures than a video clip. The speakers, located under the screen, are louder than most netbooks but still very flat-sounding. Dolby headphone surround sound gives a much better audio experience–I’d definitely recommend toting headphones around with this netbook. The Lenovo S10-3t is, at best, decent as a netbook and decent as a tablet. While it’s nice to have the functionality of both, I think I’d get better use out of something that was just really good as one or the other–a great netbook or a great tablet would be better than something that’s merely mediocre at being both.